From the beginning of American involvement in World War I in April of 1917 to the aftermath of the war some two years later, the home front across the country hummed with activity. Citizens supported the war effort by buying war bonds, growing victory gardens, and attending patriotic meetings. Factories, mines, and farms produced the goods necessary, as the people then saw it, to preserve democracy. All of these efforts were coordinated by a federal government exercising powers never used before in American history. As with the rest of America, the citizens of Wyoming poured their energies into the war effort. The Wyoming State Council of National Defense oversaw much of this work as towns clamored to go over the top with Liberty Loan subscriptions. Crops were planted. Four-Minute Men gave speeches in Wyoming communities about how to support the war. Wyoming sons from all over the state went off to war. Many of them came back. The purpose of this exhibit is to examine the facets of life on the home front in Wyoming. How did its people confront the swirling forces of conflict, both at home and abroad, during this, the War to End All Wars? Presented by the American Heritage Center. Left: Victor Loan Parade in Laramie, 1919. Courtesy Grace Raymond Hebard Papers, American Heritage Center, University of Wyoming. Center: Poster for the Tank Day Program held in Cody, Wyoming on May 1, 1919. Courtesy Grace Raymond Hebard Papers, American Heritage Center, University of Wyoming. 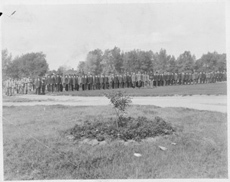 Right: Student Army Training Corps induction ceremony at the University of Wyoming, 1918. Courtesy UW War Activities Council Records, American Heritage Center, University of Wyoming.